OK, it’s not a joke, it actually happened. 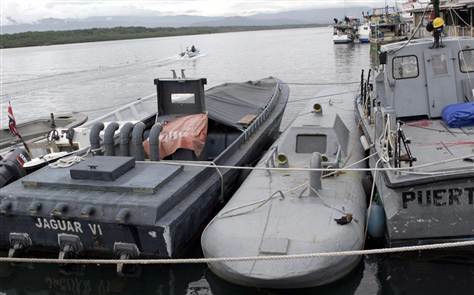 And it’s not the first time a home made submarine has been used to smuggle drugs and probably won’t be the last. The plastic breathing tubes are what gave these smugglers away. I think it’s fair to ask why 4 smugglers, holed-up in a homemade sub more than 100 miles from shore, are breathing through plastic pipes? Could they not have provided a few tanks? I mean after all the trouble they went through to build a sub from wood and fiberglass and load it up with millions in gak? Somewhere in here there’s a Kelsey Grammer Down Periscope reference but I don’t have the energy. 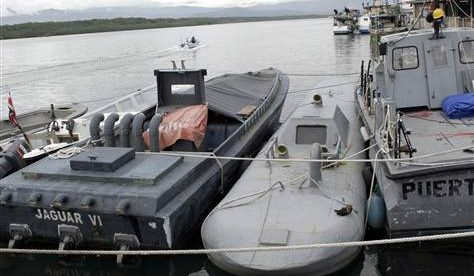 Check out Innespace for some cool fishy like diving, jumping crafts and if you’re looking for a yacht-submarine US Submarines has some models that even the snobbiest of cocaine cowboys would enjoy. More on the gear/fitness thread in the next post… promise. Larry – Thanks for the link up. Great post by the way. Funny. I will put you in my fav fitness links. Have a great day.